KUALA LUMPUR: Home buyers and property investors have snapped up over RM100mil worth of properties at Sime Darby Property’s Parade of Homes campaign. Since the campaign was launched on Nov 14, visitors have been making their way to Sime Darby Property’s 10 townships in prime locations stretching from Shah Alam, Ampang and Subang Jaya to Nilai in Negri Sembilan. More than 160 properties were sold in a two-week period. ”We’re definitely feeling very upbeat with the encouraging response from home buyers and investors alike,” Sime Darby Property managing director Datuk Tunku Putra Badlishah said in a statement. According to him, sales to-date showed that Malaysians would continue to invest in the property market, given the right incentives and assurance that they had made a safe investment despite the current economic sentiment. Sime Darby Property was offering a “guaranteed buy-back” scheme which is valid until June 15, 2009, the statement said. Under the scheme, purchasers during the campaign period can sell back their properties to Sime Darby Property with “no questions asked”. A model of Gurney Paragon. Inset: Datuk Khor Teng Tong. GEORGE TOWN: Hunza Properties Bhd has delayed the construction of the RM400mil Gurney Paragon shopping mall on Penang island, said group executive chairman Datuk Khor Teng Tong. Construction work on the mall was originally scheduled to begin in September, Khor said. “But we decided to hold back because the cost of building materials is still high,” he told reporters after the group AGM yesterday. “Although the price of steel has dropped, the other aggregates such as sand and cement are still costly. The Gurney Paragon shopping mall, with a gross built-up area of over one million sq ft with 700,000 sq ft of lettable area, was originally scheduled for completion in 2010. 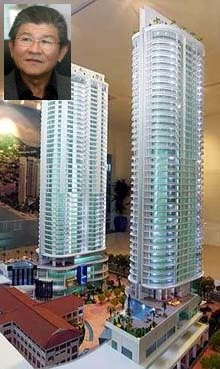 But the construction of two condominium blocks in the Gurney Paragon project, which had a a gross development value of RM400mil, would continue and should be completed in 2010, as planned, Khor said. “We started work last July and (work) has been going on non-stop since. Some 50% of the 220 units have been sold,” he added. On the soft property market environment ahead, Khor said the group would still look for land for new projects in prime locations on the island and in the Klang Valley. “We are also planning new residential projects in Tanjung Bungah on the island, Bertam on the mainland, and in Segambut (in Kuala Lumpur),” he said. The group still has about 755 acres of undeveloped land in Tanjung Bungah (nine acres), Bertam (400 acres), Juru (40 acres), Sungai Petani (300 acres) and Segambut (six acres). On Wednesday, the property developer reported lower fourth quarter and full-year results as costlier fuel and building materials eroded profits. SP Setia's fourth quarter net profit fell 24 per cent to RM76 million. Aseambankers retained its "sell" call and cut SP Setia's target price to RM2.20 from RM2.70. "With unbilled sales now at RM950 million, earnings visibility has dropped to less than a year," analyst Ong Chee Ting said. Credit Suisse maintained its "neutral" call on SP Setia, but lowered its target price to RM3.25 from RM3.50. While expecting consumer sentiment to remain poor, the analyst estimates the current financial year''s new property sales to fall to RM1.1 billion. "We expect 2009 to be a challenging year for all property developers including SP Setia," he said. OSK Research downgraded SP Setia to "neutral" from "buy", but maintained its target price at RM3.14. ECM Libra advised investors to hold SP Setia's shares and kept the target price unchanged at RM2.62. Its analyst said while he likes SP Setia's execution track record, valuations at current levels are not compelling. PETALING JAYA: Construction companies such as Hock Seng Lee Bhd, Naim Cendera Holdings Bhd and TRC Synergy Bhd would be the first beneficiaries of the Sarawak Corridor of Renewable Energy (SCORE). More housing developments supporting the increasing rural-urban migration and rising income levels would emerge at a later stage, it added. SCORE, which was the fifth and last development corridor project launched in February, has allocated RM67bil for infrastructure development projects, mostly government-funded. OSK Research recently brought 16 fund managers to Bintulu, Sarawak, to gain insight on how companies such as Sarawak Energy, Naim Cendera and Hock Seng Lee could position themselves to benefit from SCORE. “We opine that Hock Seng Lee stands to be a key beneficiary of SCORE by virtue of its strong foothold in the state. The company’s expertise in marine engineering is clearly a plus point given Sarawak’s swampy terrain,” it said. OSK Research said Hock Seng Lee was likely to gain further margins upside as it secured more jobs as a main contractor as opposed to being a subcontractor. Hock Seng Lee’s orderbook stood at RM1.6bil, of which over 80% is still outstanding. Its orderbook would keep the company busy until 2010. Year-to-date, the company has managed to secure some RM868mil worth of jobs, including the RM452mil Kuching wastewater management system job secured last month. Meanwhile, low-cost housing developer Naim Cendera would also benefit from SCORE as the proposed construction of dams would spur rural-urban migration and relocation of local tribes. 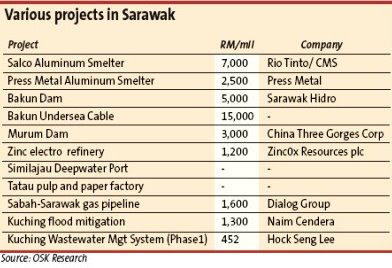 “We will see a lot of potential spillovers in terms of new projects to support one of the largest projects under SCORE, which would be the Salco Aluminium Smelter project in Similajau, that costs about RM7bil or more,” said OSK Research. The spillover would include the development of new low-cost housing to relocate residents living near the smelter, it said. With its strong reputation in the low-cost housing segment, Naim Cendera jived well with the rural-urban migration theme in Sarawak, it said, adding that mass market housing remained the key demand segment there. “Nonetheless, owing to the recent slowdown in Sarawak property market, we project a marginal 4% to 8% growth in sales for its financial year ending Dec 31, 08 (FY08) to FY10,” OSK Research said. Naim Cendera has also been awarded Phase 1 of a major flood mitigation project in Kuching worth some RM150mil. OSK Research said economic progress within the three major growth nodes in SCORE, namely Tanjung Manis, Mukah and Similajau, could also have an upward impact on property prices in the areas. Although the global economic slowdown may have taken its toll in slowing the development of SCORE, the research house believed the availability of cheap power in Sarawak should see investment return, to the benefit of companies such as Sarawak Energy, Hock Seng Lee and Naim Cendera once global credit issues were resolved. OSK Research Sdn Bhd says the immediate beneficiaries of the Sarawak Corridor of Renewable Energy (SCORE) are construction players since the necessary infrastructure must be put in place first. This would then be followed by increasing energy demand to support the industrialisation process, benefiting utility providers like Sarawak Energy Bhd. "At a later stage, we see a flurry of property developments catering for the migration from the rural to urban areas and rising incomes," it wrote in a report yesterday. "We believe the SCORE concept makes strong economic sense. We postulate that the initial development of SCORE would be centred on basic and necessary infrastructure such as roads, bridges and ports. "SCORE's allocation for infrastructure development stands at RM67 billion, which will mostly be government-funded," it added. OSK Research sees listed companies such as Sarawak Energy, Hock Seng Lee Bhd and Naim Cendera Holdings Bhd benefiting from SCORE. SCORE is the last of the five growth corridors launched by the federal government. The targeted investments in SCORE come in second after Iskandar Malaysia's RM334 billion. The development horizon of SCORE will span 22 years (2008 to 2030). It is expected to generate employment for more than three million people. The geographical coverage will stretch from Tanjung Manis to Similajau and into the hinterlands, covering 70,000km sq, or 56 per cent of Sarawak.